Photo by Karin Rabe Vance. There is a special group of first responders for arts organizations. The National Heritage Responders (NHR) was created in 2005 shortly after Hurricanes Katrina and Rita to help protect the nation’s cultural heritage from the damaging effects of natural disasters and other emergencies. FEMA and the Smithsonian Institution were instrumental in the creation of this task force of specially trained conservators to help cultural organizations salvage their unique collections such as props, costumes, books, musical scores, textiles, paintings, photographs, sculpture etc. Prior to 2005, conservators possessed the much-needed expertise to save collections, but the administrative structure to coordinate the distribution of those skills was lacking. The program has since developed into a cohesive nationwide volunteer group of 107 strongly committed conservators. 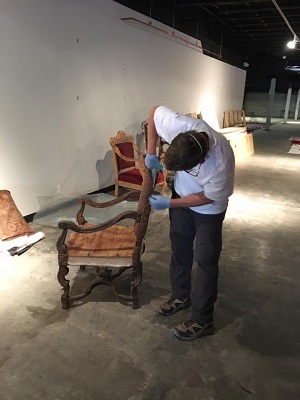 Steve Pine, an NHR member who lives in Houston and works for the MFAH was the Alley’s first responder for our acclaimed props collection which was completely submerged for 2 days by 10 feet of black floodwater. He coordinated the visit of 3 NRH members -- Team Leader Dennis Baltuskonis and his wife Pam Baltuskonis from San Antonio and Jon Brandon from Brunswick, Maine who worked in the props storage areas for 2 days alongside Alley Properties Manager Karin Rabe Vance and her team. They aided in assessing the damage, packing out items that could be salvaged for transport to a triage warehouse and providing recommendations for cleaning and halting the growth of mold. The Alley’s properties staff believed that the NHR members time and expertise helped us reclaim about 25% more of our collection than initially thought. In turn, the NHR members learned more about salvaging theatrical properties and were surprised to learn that some “antiques" were actually built by Alley artisans.